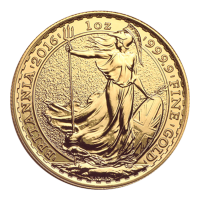 وجه العملة Ian Rank-Broadley Effigy of Queen Elizabeth II and the words "'Elizabeth 'II' D'G Reg' Fid' Def' 100 'Pounds"
1oz 2016 Britannia Gold Coin Buy a 1 oz 2016 Britannia gold coin at the best price online. We offer this gold coin with 9999 purity worldwide, and it may qualify for free shipping! As one of the oldest and most recognizable designs in the world, this coin symbolizes beauty, strength and reliability. It features a reverse design by Philip Nathan of Britannia holding a trident and shield. The obverse of this coin features Her Majesty Queen Elizabeth II with the face value of 100 pounds. Protect your savings in a prudent fashion, order yours today.